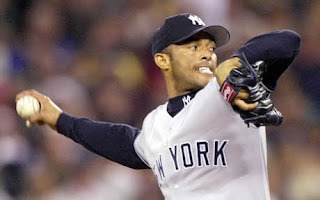 The New York Yankees could have their closer back as soon as today, according to Mark Feinsand of the NY Daily News. Mariano Rivera, who hasn't pitched since September 1st, felt fine after a 16-pitch bullpen session. "I wasn't expecting to feel anything," Rivera said. "That's how minor it was. We just had to make sure that it's ready. I wasn't looking for something or expecting something." Since Rivera's last appearance, Phil Hughes has closed out two of two save opportunities. In the process, Hughes struck out six of the eight batters he faced while not allowing a hit. "We've gone away from that the last three or four weeks because we didn't want to wear him down," Girardi said. "I'm going to ask him every day how his groin is. We've been careful how we've used him all year." With the effectiveness of Hughes, who hasn't allowed an earned run since August 4th, Girardi has the flexibility to not overuse Rivera, who has converted 38 of 39 save opportunities.